Top 500 LIVE! 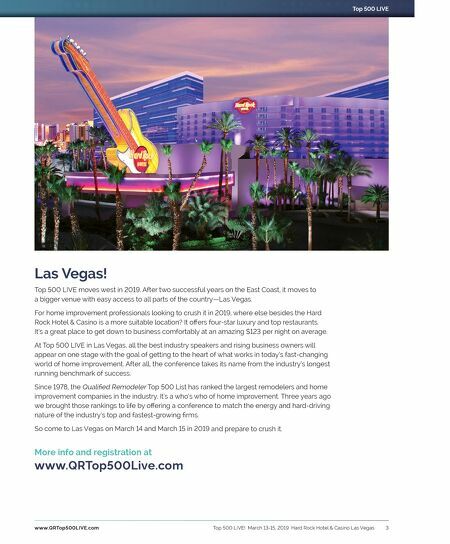 March 13-15, 2019 Hard Rock Hotel & Casino Las Vegas 3 www.QRTop500LIVE.com Top 500 LIVE More info and registration at www.QRTop500Live.com Las Vegas! Top 500 LIVE moves west in 2019. After two successful years on the East Coast, it moves to a bigger venue with easy access to all parts of the country—Las Vegas. For home improvement professionals looking to crush it in 2019, where else besides the Hard Rock Hotel & Casino is a more suitable location? It offers four-star luxury and top restaurants. It's a great place to get down to business comfortably at an amazing $123 per night on average. 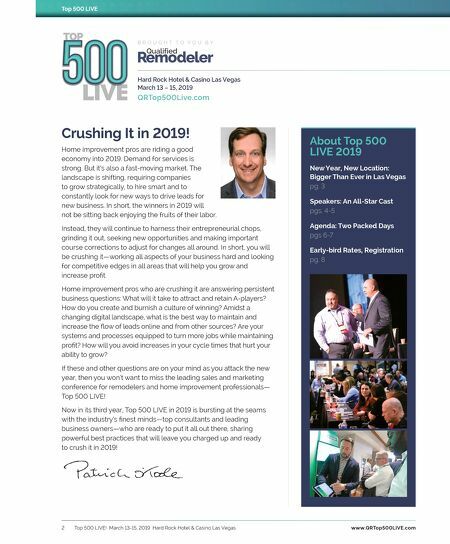 At Top 500 LIVE in Las Vegas, all the best industry speakers and rising business owners will appear on one stage with the goal of getting to the heart of what works in today's fast-changing world of home improvement. After all, the conference takes its name from the industry's longest running benchmark of success. Since 1978, the Qualified Remodeler Top 500 List has ranked the largest remodelers and home improvement companies in the industry. It's a who's who of home improvement. Three years ago we brought those rankings to life by offering a conference to match the energy and hard-driving nature of the industry's top and fastest-growing firms. So come to Las Vegas on March 14 and March 15 in 2019 and prepare to crush it.